Accessorize your power chair or scooter with an attractive canopy. With its bright red color, family members can find you in a crowd and if you live close by, we'll install it for you for a nominal charge. The attaching frame is removeable with simple tools; however the canopy is removeable within seconds. We also sell and install cup holders for scooters as well as manual and powerchairs. In our business, one size doesn't fit everything. So, we offer more than one model holder. They average $20 to $25. Interchangeable. Most scooters come standard with a front basket; however when life comes at you fast, the basket may wind up on the losing end. They usually meet their demise between a door and the doorframe. 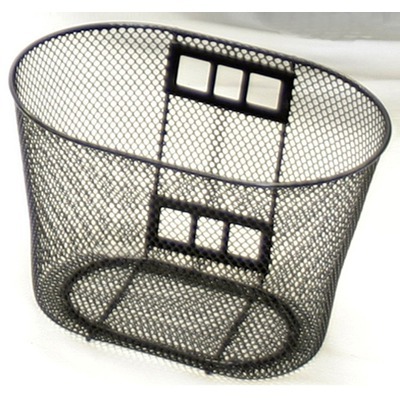 We adapt, sell, paint and repair baskets. Removeable. This rear-mounted basket can be installed on scooters and powerchairs. If your existing equipment doesn't have a square tube for the basket receiver to slide into, hardware is available to make it compatible. Removeable. Armrest bags are available for both scooters and wheelchairs. This bag is a large model. Available in fabric or metal holders, oxygen tank holders are also available for wheelchairs and scooters. Removeable and washable. If you travel or store your mobility equipment outside, we recommend a full-size cover. If you purchase a cover from another source, buy one with grommets so you can use bungi cords to hold the cover down when you travel. If you use your equipment in parking lots, please consider purchasing a flag. Drivers may not see you until its too late. A flag could save you a costly repair or even your life. Crutch holder mounted to the rear of your scooter or wheelchair seat back. Removable.